A recent example: I saw this great activity in the September Family Fun magazine -- a marble coaster made from the edges of paper plates and toilet paper rolls. Seemed simple and straight forward. We started out cutting the plates for the coaster on the patio table since it was a beautiful day. My son really enjoyed cutting up the parts of the plates. It started so well, but as we attempted to put it together, it started falling apart, literally. I didn't have glue dots as the instructions specified and was substituting tape... bad idea. 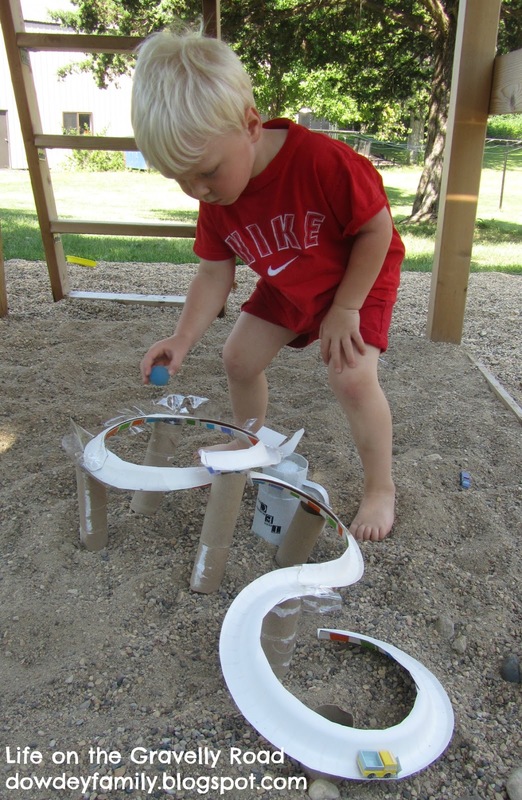 We were trying to assemble it in the sandbox (thinking it would be easier to adjust the heights of the supports) but the sand + tape + three year old was a terrible combination. I was quickly getting frustrated. Then I took a deep breath. "I'm not sure we'll be able to get this to work today" I said. "But this is fun!" my son replied. I was confused, the coaster track was not staying together. 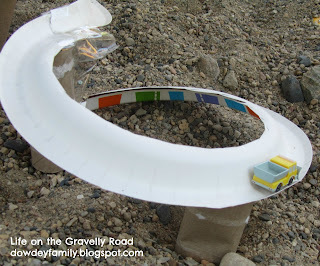 The marbles and small cars we were using were either falling off or getting stuck on the way down, and the whole thing kept tipping over. "What part is fun?" I asked. "You and me in the sandbox! I like you to be in the sandbox." My son doesn't care if the projects turn out or if they are picture-worthy. He wants me, my time, my undivided attention, next to him, with him, together in the sandbox. That I can do. Oh, I love this, Krista! Your "fail" was your son's WIN, just because he got to play with his mama in the sandbox. What a great story! Thanks Julia! Your post the other day inspire this one :) I'll go link up with Mama Loves. I'll see if I have time for one more "real life" post as well this week. Thank you for reminding me of such an important truth--our children want us--our time. Beautiful!